If you're using Office 365's Advanced Threat Protection (ATP) feature and you want to exempt KnowBe4's phish domains from being rewritten, below are steps to do so. Keep in mind, though, if you're not exempting any other URLs from being rewritten: Exempting only KnowBe4's phish domains will provide a red flag for your users to know when they receive simulated phishing emails. First, submit a support ticket to KnowBe4's support team and request a list of our root phishing domains. Once you receive the root domains, move on to next step. Log into your Office 365 Admin Center by clicking on Admin > Exchange and then click on advanced threats, then safe links. 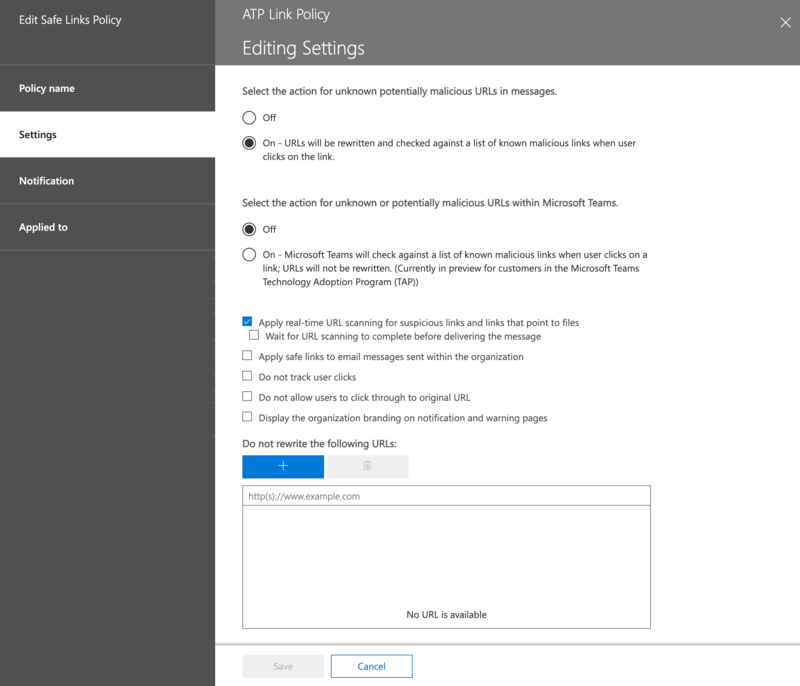 Double-click on the name of your Link Policy (ATP Link Policy in this example) and select settings. You can then add the root domains you received from the Support team to the list under Do not rewrite the following URLs:. Be sure to add an asterisk (*) prior to each phish domain prior to entering it if there is not one already.